Miniature replica of the human knee made into a clever, anatomical key ring. Made of durable plastic Miniature replica of the human skull made into a clever, anatomical key ring. Made of durable plasti Go skinless with this amusing design and learn the real names for your big toe, shin bone and more. 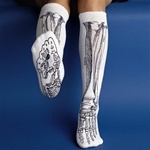 Go skinless with this amusing design and learn the real names for your big toe, shin bone and more.